Thames & Hudson. New. 1996. Paperback. 0500202923 . *** FREE UPGRADE to Courier/Priority Shipping Upon Request *** - *** IN STOCK AND IMMEDIATELY AVAILABLE FOR SHIPMENT - Text pristine & unmarked, tight to the spine - 304 pages; 302 illustrations including a number in color; 8vo. Thames & Hudson. New. 2016. Paperback. 0500204330 . *** FREE UPGRADE to Courier/Priority Shipping Upon Request *** - *** IN STOCK AND IMMEDIATELY AVAILABLE FOR SHIPMENT - Flawless copy, brand new, pristine, never opened  with a bonus offer . 2005-03-09. New. Ships with Tracking Number! INTERNATIONAL WORLDWIDE Shipping available. Buy with confidence, excellent customer service! 2016-09-01. New. Ships with Tracking Number! INTERNATIONAL WORLDWIDE Shipping available. Buy with confidence, excellent customer service! 1996-01-08. New. Ships with Tracking Number! INTERNATIONAL WORLDWIDE Shipping available. Buy with confidence, excellent customer service! 1985-05-01. New. Ships with Tracking Number! INTERNATIONAL WORLDWIDE Shipping available. Buy with confidence, excellent customer service! 2007-02-04. New. Ships with Tracking Number! INTERNATIONAL WORLDWIDE Shipping available. Buy with confidence, excellent customer service! Frederick A. Praeger, 1964-12-31. 1st. Paperback. Used:Good. Praeger. Hardcover. 0500181411 New Condition. . New. Oxford Univ Press. PAPERBACK. 0195199170 New Condition. . New. Thames & Hudson. PAPERBACK. 0500204330 New Condition. . New. Thames & Hudson. PAPERBACK. 0500202923 New Condition. . New. 1996-01-08. Good. Ships with Tracking Number! INTERNATIONAL WORLDWIDE Shipping available. May not contain Access Codes or Supplements. May be ex-library. Shipping & Handling by region. Buy with confidence, excellent customer service! 2005-03-09. Good. Ships with Tracking Number! INTERNATIONAL WORLDWIDE Shipping available. May not contain Access Codes or Supplements. May be ex-library. Shipping & Handling by region. Buy with confidence, excellent customer service! Thames & Hudson, 1996-11-17. 4th Revised. Paperback. Used:Good. Oxford Univ Press. PAPERBACK. 0195199170 Like New Condition. . Fine. Thames & Hudson. PAPERBACK. 0500202923 Like New Condition. . Fine. Praeger. Hardcover. 0500181411 Like New Condition. . Fine. Thames & Hudson. PAPERBACK. 0500204330 Like New Condition. . Fine. Norton & Company, Incorporated, W. W., 1964. Paperback. Good. Disclaimer:A copy that has been read, but remains in clean condition. All pages are intact, and the cover is intact. The spine may show signs of wear. Pages can include limited notes and highlighting, and the copy can include previous owner inscriptions. Thames & Hudson. Paperback. 0500202923 BRAND NEW! In Protective Shrinkwrap! A Glossy Paperback in NEW, pristine condition. We ship all orders with delivery confirmation! . New. 1996-11-17. 4th Revised. Thames & Hudson Ltd, 1973-12-31. Paperback. Good. Praeger World of Art, New York, 1965. First thus. Softcover. Very Good Condition/No Dust Jacket. First edition of the work in this format/ binding, and/or publisher, title, set or series. Size: Octavo (standard book size). 287 pp. Text is free of previous owner's markings. Binding is tight, covers and spine fully intact, but spine is creased. No foxing in this copy. Edges very slightly spotted or marked. General shelfwear to covers edges and corners with creasing on the cover. Quantity Available: 1. Shipped Weight: Under 1 kilo. Category: Art & Design; Greece; Ancient (BC); #34098; Pictures of this item not already displayed here available upon request. Inventory No: 37483. .
Oxford Univ Press, 1964-01-01. Paperback. Used:Good. Thames and Hudson Ltd, 2016 Book. New. Paperback. New and in stock. Thames & Hudson. Paperback. 0500202923 . New. 1996-11-17. 4th Revised. Thames & Hudson. PAPERBACK. 0500204330 Brand New ,Original Book , Direct from Source , Express 5-8 Business days worldwide Delivery. . New. Thames & Hudson, November 1996. Trade Paperback. Used - Very Good. This book will do for the next generation of students and general readers what its predecessor has done for the last - provide and authoritative and readable guide to the history of Greek art. It is a considerably enlarged and rewritten version of a work that has a considerably enlarged and rewritten version of a work that has served hundred of thousands in many languages since the early 1960s. As the author says, 'This edition is different in that it takes into account new finds as well as new ideas and attitudes to the subject...I have attempted here to place Greek art back into Greece and away from galleries and art books, to try to recapture what it meant to its makers and views, and so better value what it has meant to later artists in the western world. 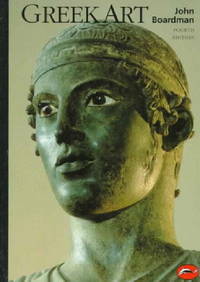 'One of the very best short histories of Greek art.' Financial Times Slight scratching/scuffing on cover. Book has black mark on the bottom. N.Y: Oxford University Press. Very Good. 1974. Soft Cover. 8vo - over 7¾" - 9¾" tall Highly Recommended Seller. 249 plates, 30 in color . Thames & Hudson. PAPERBACK. 0500204330 *BRAND NEW* Ships Same Day or Next! . New. Thames & Hudson. PAPERBACK. 0500204330 *LIKE NEW* Ships Same Day or Next! . Fine. N.Y.: Praeger, 1965 Soft Cover. Very Good. 8vo - over 7¾" - 9¾" tall. Thames & Hudson, April 1985. Trade Paperback. Used - Very Good. Very nice clean, tight copy free of any marks. Frederick A Praeger. Fine with no dust jacket. 1966. First American Edition; Third Printing. Paperback. We fit archival quality clear acrylic covers for additional protection whenever possible. ; (Praeger World of Art Paperbacks) ; Color Illustrations; 8vo 8" - 9" tall . London: BCA, 1973. No marks or inscriptions. A very clean very tight copy with bright unmarked boards, slight foxing/tanning to page edges and no bumping to corners. Dust jacket not price clipped or marked or torn or creased with minor traces of storage. 252pp. A well documented, very well illustrated study of the art in classical Greece, architecture, sculpture, pottery, painting and metalwork.. Hard Cover. Very Good (+)/Very Good (+). 8.5 x 6 inches. London: Book Club Associates, 1973. Minor wear to jacket. Please Email for further details. Not Signed or Inscribed. This Edition 1973. Olive Green Cloth. Very Good + (ABOVE AVERAGE)/Very Good (AVERAGE). Illus. by With 249 Illustrations , 30 in Colour . 8vo - over 7¾" - 9¾". Hardback. Thames & Hudson, 1985-05-01. Revised. Paperback. Used:Good. Thames and Hudson 1965. Hardcover super octavo (VG+) in d/w (VG) ; all our specials have minimal description to keep listing them viable. They are at least reading copies, complete and in reasonable condition, but usually secondhand; frequently they are superior examples. Ordering more than one book will reduce your overall postage cost.